‘To write text that stops visitors in their tracks’ – that’s what one person who saw our seminar at the Museums Association conference wants to do. So they’ve booked a place at the TextWorkshop on 10th November at the London Transport Museum, to find out more. 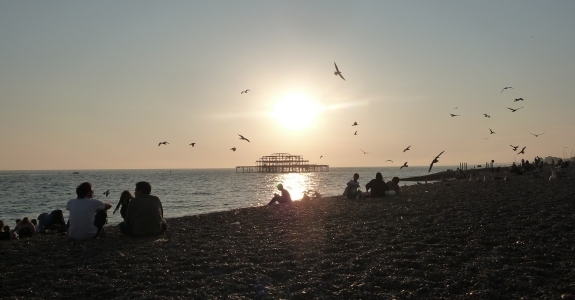 With the autumn sun shining on the beach just outside, it was great to see so many people crowding into our seminar in Brighton on 3rd October. Better text-writing is firmly on the agenda for so many people – and we are here to help! We shared our new postcards in the session, and tried out some of our top tips for text-writing – but there’s much more to say than we could manage in an hour, so we’d love to see you at one of our forthcoming TextWorkshops at the London Transport Museum in November or at the Design Museum in February. The courses are filling up, so do book a place here on the website, or get in touch if you’d like to discuss an in-house workshop with your team.